We are located 20 minutes NE of Philadelphia, on New Falls Road between the Penn Valley Road(a.k.a. Hood Blvd.) and Levittown Parkway(a.k.a. Oxford Valley Road) Intersections. We are in the large Tan and Green building to the right of Kenwood Pools, directly behind their pool display park. For Mapquest directions, click here. -Take Stony Hill Rd. towards Fallsington. Follow all the way until it dead ends. -Make a right on Tyburn Rd./Woolston Dr.
-Follow approximately 1 mile. After you pass the Burger King on your right, we are another 200 yards up on your left, next to KenwoodPools. -Take Business 1 to Tyburn Rd. -Turn left on Tyburn Rd. and follow to New Falls Rd. -Turn Right on New Falls Rd., and follow approximately 1 mile. After you pass Burger King, we are on your right hand side, next to Kenwood Pools. -Turn Right on Bristol/Oxford Valley Rd. (at the Pep Boys intersection), and make a quick left on Oxford Valley Rd. Follow approximately 2 miles. -After you pass the YMCA on your left, turn left on New Falls Rd. 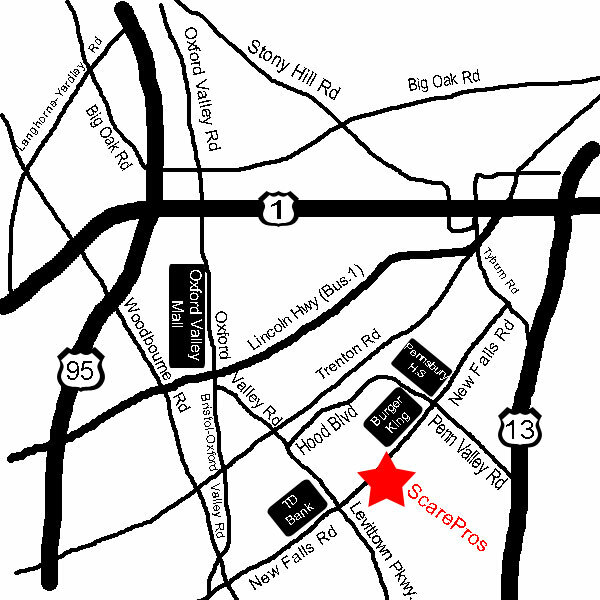 -We are located 1/4 mile up on your right side, next to Kenwood Pools. -Take Rt. 13 towards Morrisville. -Turn Left at Levittown Pkwy. -Turn right at New Falls Rd. We are 1/4 mile up on your right, next to Kenwood Pools. -From Rt 413, take New Falls Rd. towards Fairless Hills. Follow about 10 minutes. Cross over "5 Points" intersection. -After you cross the Levittown Pkwy/Oxford Valley Rd. intersection, we are 1/4 mile up on your right, next to Kenwood Pools. -Take 95 North 18 miles. -Take exit 40 for PA-413. Go almost 1 mile. -Turn left at New Rogers Rd/PA-413. Go almost 1.5 miles. -Turn right at New Falls Rd. Go about 3.5 miles. -After you cross Levittown Pkwy/Oxford Valley Rd intersection, we are 1/4 mile up on your right, next to Kenwood Pools.